One of the largest manufacturers and sellers of beauty and personal care products with annual revenues of over $2.5 billion, and a worldwide operating presence in over 130 countries. The company’s product portfolio includes: hair products, cosmetics, beauty treatments, fragrances, skin care products and more sold through retail channels and specialized beauty salons. With an aggressive growth plan to double sales within five years to reach the $5B mark, our client determined that concentrating on value-creating activities that drove revenue growth was the strategic priority going forward. The two avenues chosen by management to accomplish this goal were to grow the business organically while pursuing strategically accretive acquisitions. 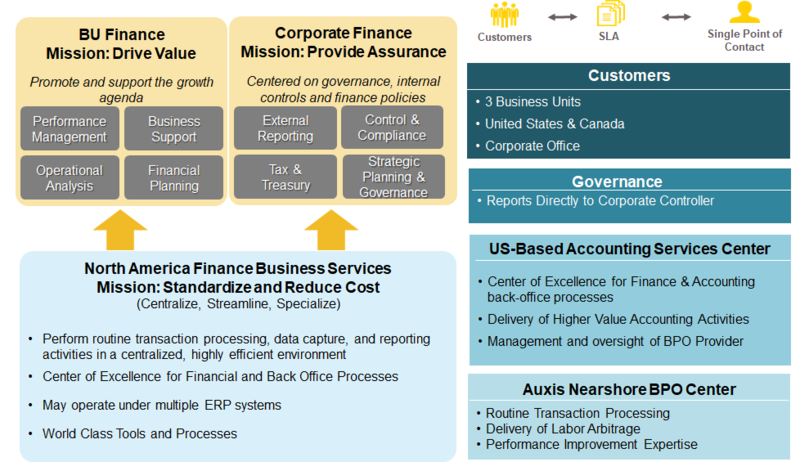 Although these approaches might appear to be significantly different, one common element they shared was the requirement of a cost-efficient Finance & Accounting (F&A) operating model that was scalable to support the expected growth while allowing the company to focus on its core competencies. The current finance organization was still managed in a very decentralized environment, with only one of its three business units being partially managed under a centralized organization that lacked the characteristics of a true shared services model. While some F&A processes were quite complex, most of the activities were transactional in nature, tying up critical business resources that would be better used towards revenue generating activities such as business development, competitive and product marketing analytics, strategic sourcing initiatives, and the pursuit and integration of strategic acquisitions. Auxis was engaged to design and implement the Shared Services Strategy & Operating Model for the client’s North American back office operation to support the consolidation of three distinct business units, including the integration of a recent acquisition into one Shared Services Organization. Define the most optimal Shared Services Operating Model, evaluating multiple location scenarios/business cases that included both "captive" models (all in-house) and "hybrid" models with an outsourcing component from Auxis Nearshore Center in Costa Rica. Migrate transactional accounting functions to the selected lower cost location to start delivering cost savings during the first year. Revamp the existing Shared Services Organization in the US to become a true “Center of Excellence” (CoE) versus a pure transactional center. The proposed and selected hybrid model included the migration of multiple F&A transactional activities to Auxis’ Nearshore Center in Costa Rica (over 50 FTEs), as well as the establishment of a Center of Excellence (COE) in the client’s US-based Shared Services. Some of the workload redistribution involved reallocating higher value work back to the Departments that should be more focused on value creation while re-leveling the span of control and reducing headcount based on industry benchmarking and synergies from the centralization of processes. 33% Cost Savings through the initial “lift and shift” approach, with an IRR of 90% and a payback period of less than 2 years. Auxis is currently implementing Robotics Process Automation (RPA) to automate multiple F&A processes, including AP Invoice Processing, Journal Entries Processing, etc. If you're interested in learning more about RPA, download our newly published 2018 Robotics Process Automation (RPA) Survey Report: Where Are We With RPA? Develop Process Inventory - This first step is critical to the success of any process migration as it provides foundation that the various business units will need to follow.